In many inspirational and success quotes, I often see photos of rock climbers scaling seemingly impossible heights. 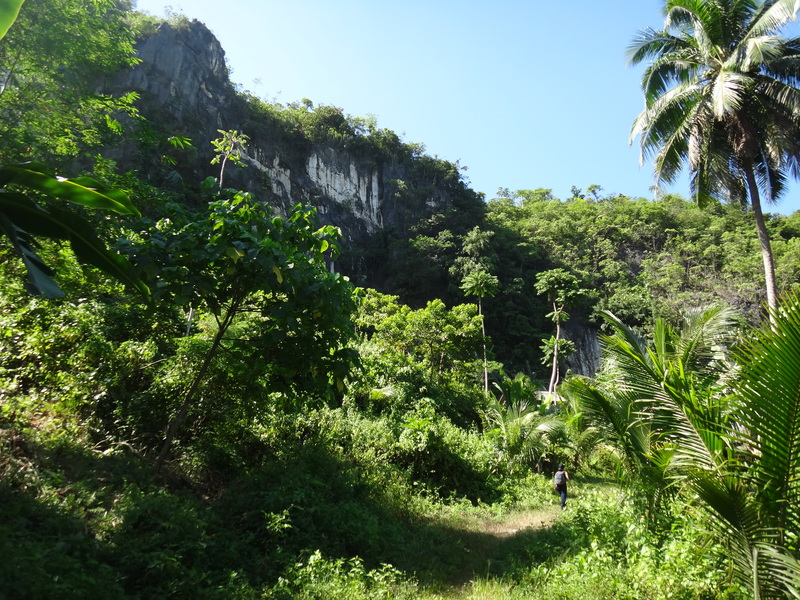 Now, after rock climbing for the first time at Tinandog Wall, Atimonan, Quezon, and ticking this exciting activity off my bucket list, I understand why. Rock climbing is a perfect metaphor for life. What were once just inspiring concepts to me became happily – and painfully – real experiences. Rock climbing is not only an enjoyable adventure but also a great life teacher. 1) Prepare. Rock climbing is a physically demanding activity and requires preparations like wall climbing. I wasn’t able to join the pre-climb meeting and wall climbing with my travel companions, and I paid dearly for it during the actual climb. As with anything you want to accomplish or achieve, preparation is key. 2) Seize the day! At the same time, don’t let the need for perfection be an excuse to let an opportunity pass you by. If your gut feel says that you can do it, then go! When I received this rock climbing invitation from a friend, I wanted it but had mixed feelings because I knew I would be too busy to fully prepare. But, not knowing when this chance would come again at a time I am free, I accepted it, praying that my little experience with mountain climbing minor peaks this year as well as doing wall climbing once several years ago would make some difference. And, I somehow felt I could do it – and I did! 3) Commit – take that step. This is what Pastor Noel Suministrado, our trip organizer and lead climber, as well as a pastor in a church in Lucena, kept telling us again and again. While a vertical rock face may look intimidating, it can be climbed, one step and one grip at a time. And in some areas, inch by inch. I was particularly surprised when I was able to step on a seemingly tiny crack which I thought at first could not hold my feet. And that crack actually helped me ascend to the next step. Similarly, some goals may look difficult or impossible at first, only because you have never done them before. I believe the way is to take baby steps. 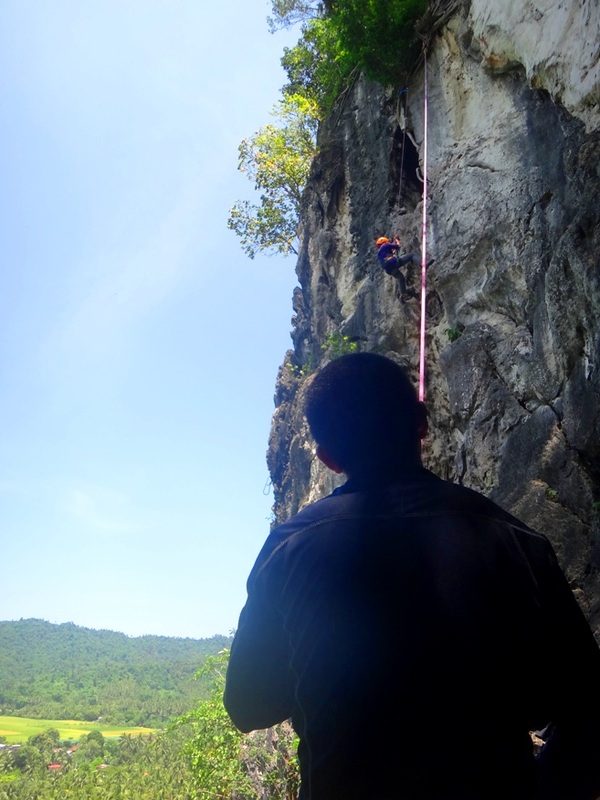 Pastor Noel, our lead climber, shows how this rock wall can be climbed one step at a time. 4) Trust. This, I believe, is the essence of rock climbing. And this is more than just trusting in yourself to do it. In our rock climbing, there was a belayer, Manny, who anchors us to the ground. Manny pulls the rope as we go up and gives us just the right amount of slack – this is so that should we lose our footing and fall, we won’t fall far. And, if we fall, he will “catch” us. This very basic trust on our belayer is what enabled us first-timers to confidently scale the rock face despite threats of fall. And yes, we did fall. But he was there to catch us. Our belayer Manny keeps us safely anchored and “catches” us when we fall. I’ve also found in some crucial moments in my life that the saying “leap and the net will appear” is true. Acting with faith based on only the information I could get, I took risks and life rewarded me generously. 5) Surround yourself with people who support you. These are the people who cheer you on in your hopes, dreams and projects – people who believe in you and strengthen you. I only knew one of the people joining that rock climbing adventure, but during my climb, all of them were full-out in their support. Even though my climb was excruciatingly slow, the group enthusiastically cheered for me. With my each misstep and fall, they cheered louder and encouraged me with words like “Konti na lang yan!” (Just a little more!) 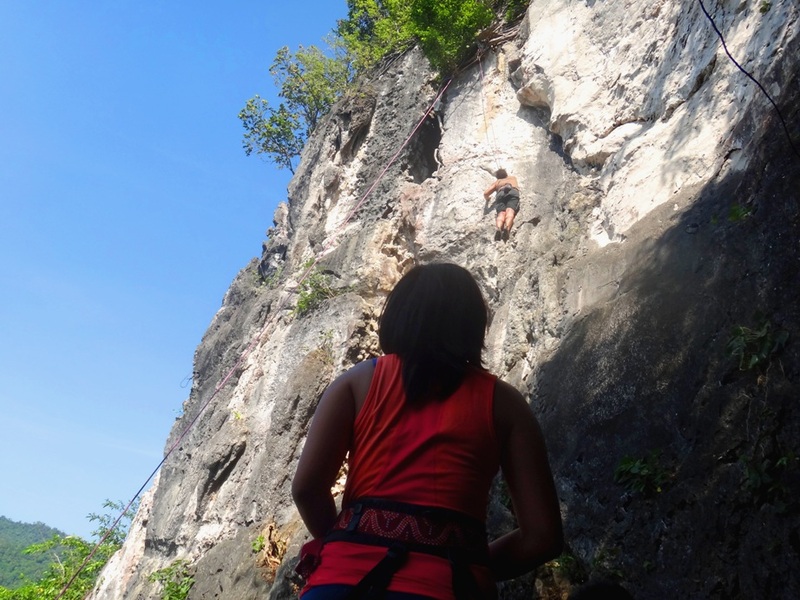 Pastor Noel and those who have climbing experience also coached me. And, when I finally got it right, they cheered in excitement as though sharing my victory. Actually, all of us cheered for whoever was climbing at the moment. 6) It’s most tempting to quit when you’re almost at the finish. Don’t. I’ve been reading quotes like “it is darkest before dawn” and the more cliché “so near yet so far.” But it was during the final moments of my climb that I really felt the truth of these words. My arms and hands felt like lead, and my legs did not seem to follow my will, even after several attempts. My heart beat furiously and I gasped for air. Fatigue had set in. Just three or four feet away, I could see the bright blue anchor point signaling the finish, and yet I was tempted, sorely tempted, to give up and signal to Manny to take me down. The words were in my tongue and I almost said them. But I did not. As the saying goes, “rest if you must, but don’t you quit.” I let my body hang in midair and I caught my breath for some minutes until my mind began to clear again. What was almost impossible to me some minutes ago slowly became probable. And, just when I thought I was at my limit, my second wind rushed in, and I reached for the goal! 7) But above all, listen to and honor your intuition. Yes, there is such a thing as a second wind and there is wisdom in the timeless advice of never giving up, but above all, let your inner knowing decide. It was this knowing that told me that I should rest first before I climb that last three feet. It was also this same knowing that prompted me not to push myself to finish the second climb. 8) Have fun in the journey. Pastor Noel said that the best climber is not the one who reaches the peak or end point fastest, but the one who is happiest. I agree. 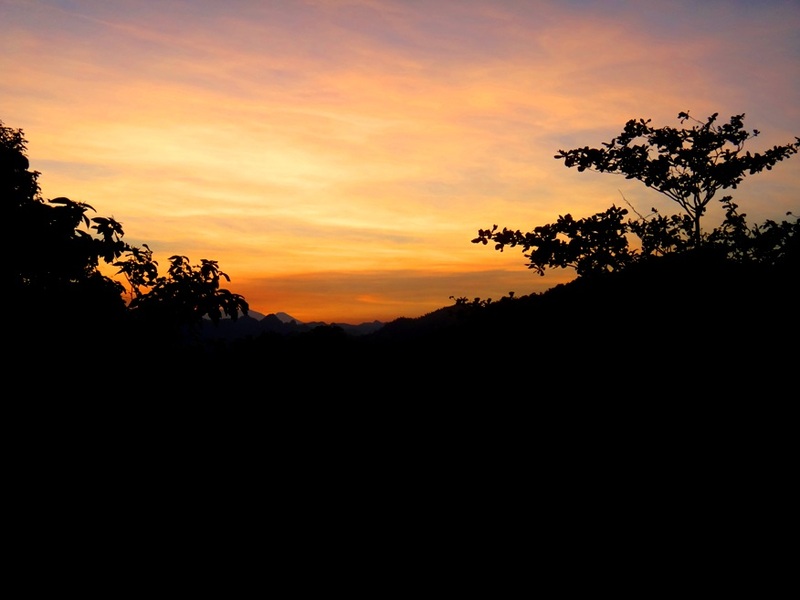 Which was why, during my second climb that day, I ascended at a more leisurely pace and watched the sunset. There is nothing quite like the feeling of climbing on golden rocks slowly turning grey and seeing the sunset, plains, and trees from above. 9) Celebrate your success! We celebrated with local lambanog (coconut vodka) after finishing the day’s climb. Later, over a quick dinner, we shared our highs and lows. Karl said we should give ourselves a pat on the back for accomplishing what we did that day, and we did. I believe celebrating your success is important as it psyches you up for your next goal and challenge, and it gives you encouragement for moments when things seem impossible. During low points, I will remember those last excruciating minutes of my first climb and the heady rush of finally reaching the top. And, I can cheer myself with the knowledge that I have done this before, and I can do it again. 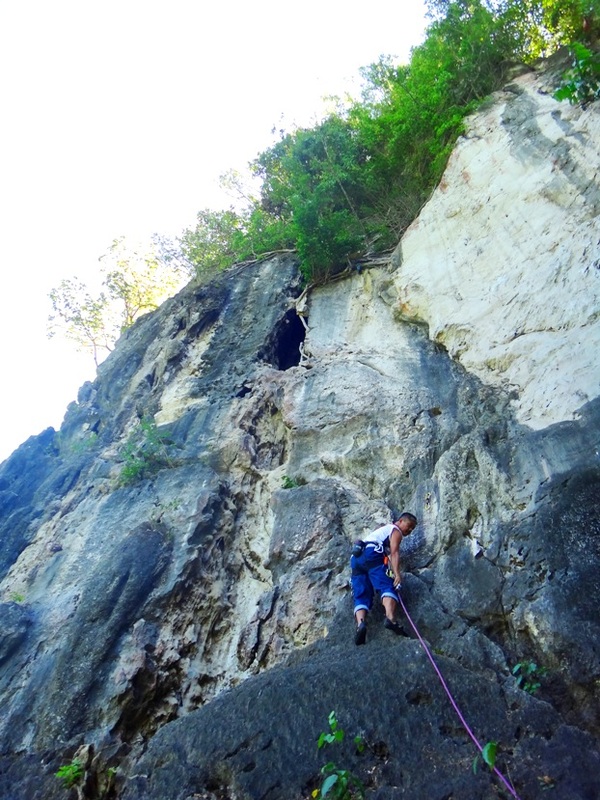 This is Part 1 of my two-part series on rock climbing at Tinandog Wall, Atimonan, Quezon. 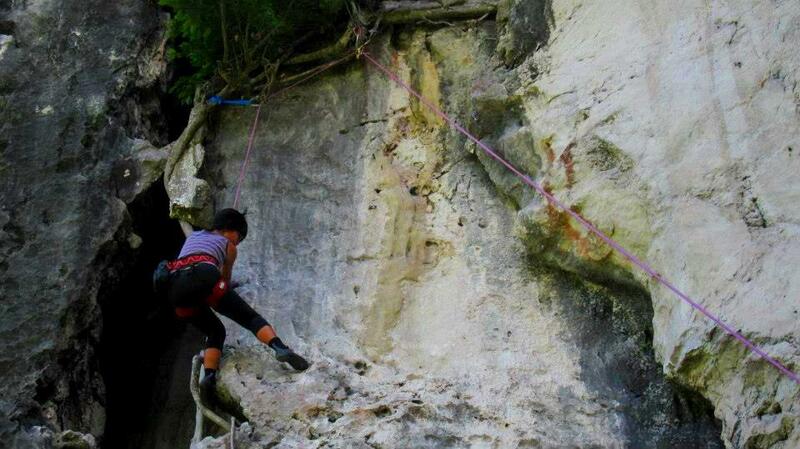 Check out Part 2 – why you should go rock climbing at Tinandog Wall plus the cost and logistics to make it possible. Thanks, MIca! 🙂 Yep, it is a physically demanding activity and needs enough preparation. Looking forward to that day na gagawin ko rin yan. 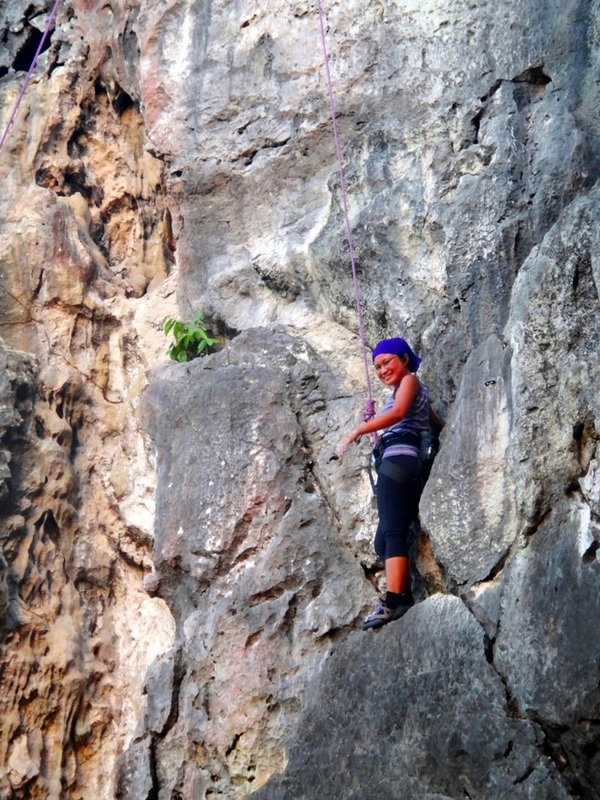 whew… i’ve done several rappelling but i haven’t dared the rocks..
That’s a very nice blog post. 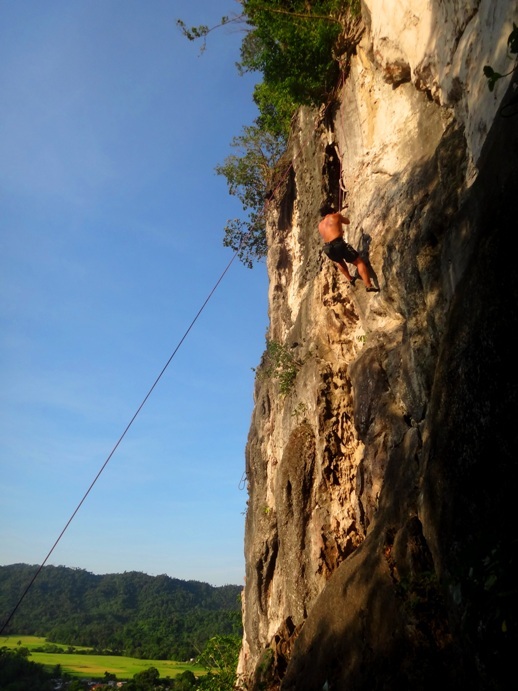 Rock climbing indeed teaches a lot about life, specifically on trust, willpower, determination, and the realization that fear is just a thought that you generate. 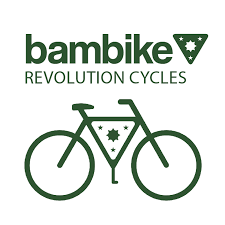 My relationship with Sweetie grows stronger each climb as we entrust each other’s lives, support, and encourage each other to scale the routes and reach the anchors. More importantly, rock climbing helped us conquer our own figurative crags in life. We support each other in ascending our “routes” and reach our “anchors” as a team. Really hoping I could join the next climb! And btw, is that Karl in the top photo? I think he lost weight climbing big-time! I need to be really physically and mentally ready for this kind of activity. haha but rockclimbing is one on my bucket list! You are one brave girl, Claire 🙂 I Really admire you! Thanks, Pauline! 🙂 I’m sure you can do it too!